Well it really blew up in Indiana last week, but Michigan is fixin’ to do the same thing: pass a law that essentially legalizes discrimination under the guise of protecting religious liberty. And why should we be suspicious of this Republican-led effort when they assure us that they have the best of intentions? Well, it’s an ol’ GOP duplicity, I suppose. Sunshine Week is a national initiative spearheaded by the American Society of News Editors to educate the public about the importance of open government and the dangers of excessive and unnecessary secrecy. 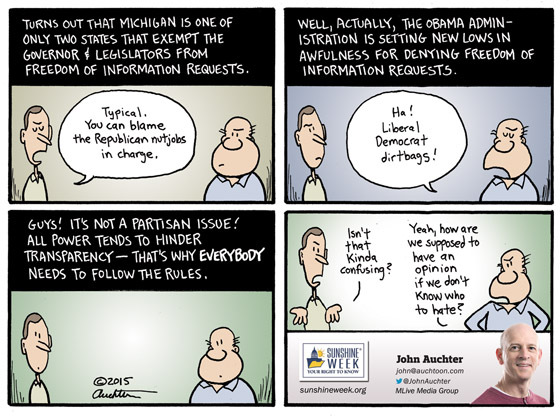 It was actually March 15–21 this year, but I had just found out the bit about our Governor and legislators being exempt for FOI requests, so I figured the week after was still topical. 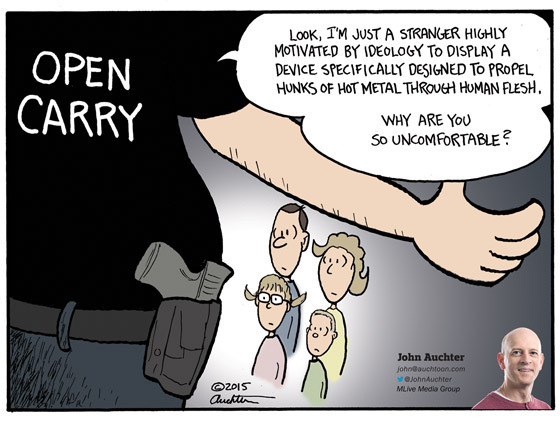 The cartoon itself is kind of a reaction to last week’s cartoon about open carry. The comments continued to pour in with the majority summarily dismissing any larger point I was attempting to make by lumping me into a political category — liberal dirtbag in this case. It’s unfortunate because it salts the earth to prevent any sort of real discussion from growing, which is exactly what excessive and unnecessary secrecy needs to thrive. Open Carry — Why Are You So Uncomfortable? As you might imagine, I have received quite a bit of feedback on this one. People are passionate about guns in these United States, so it’s not at all surprising. Really, the only thing I don’t quite understand is how questioning the wisdom of open carry at public events makes me a feminine hygiene product. But more than one person seems convinced of this. Recently in Ann Arbor there was a young man who walked into a high school for a choir concert with a gun on open display on his hip. Because of the way Michigan concealed weapon laws work, this was perfectly legal, but it still caused quite a stir. Soon thereafter more than 25 others open carried into a school board meeting. There was a similar test of wills going in in Grand Rapids last year at public meetings with the city council. America is a large and varied land with a large and varied people. It’s difficult to make one-size-fits-all laws. That’s why it’s so important for people to consider the consequences of their actions. It may be legal to attend a school event or crowded public meeting with a gun on open display, but it doesn’t necessarily make it a good idea. It completely changes the focus. So it’s no longer, “looking forward to hearing my kid sing” or “I want a stop sign at the end of my street.” It’s “who’s the dude with the gun?” That’s more than a little selfish. And if you are doing it to prove a point, well then you can’t play the victim when people are upset with you. 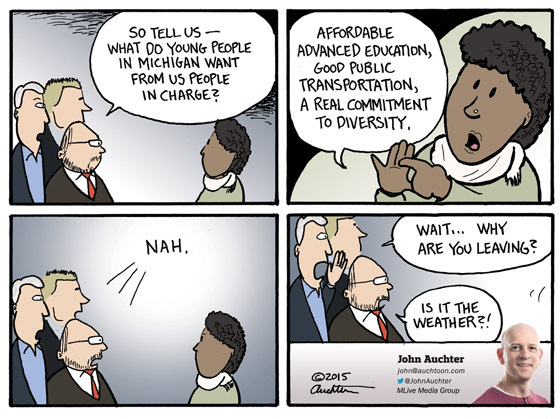 What Do Young People in Michigan Want? For years now in Michigan there has been this ongoing pattern of people in charge fretting over younger people leaving the state. There is all the standard lip service for “the youth are our future” and the need to grow and the next generation and blah blah blah. There is a vague sort of “we need to do something” and the natural follow up of “what would that be?” Then it’s “let’s ask young people,” lots of self-congratulations for being so smart to think of such a thing, the youth are asked, their requests sound expensive and politically inconvenient, it’s back to business as usual, and more young people leave the state. Must be they don’t like winters, huh? 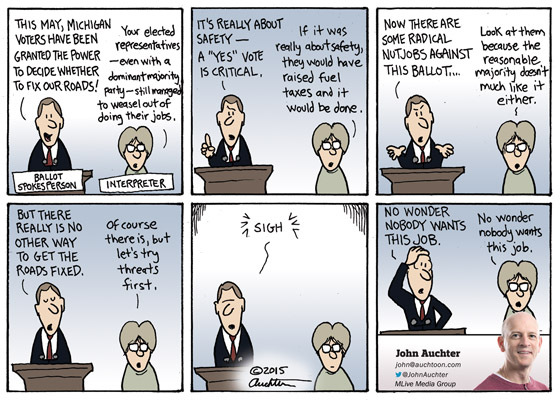 As the cartoon says, this May 5th Michiganders will vote on a ballot proposal for fixing our roads. Well, that’s the pitch. It’s actually much more (and needlessly) complicated than that. Which is why proponents have been having a difficult time finding people willing to shill for it. I mean, literally. A public relations firm lined up to sell the virtues quit earlier this year, and it seems nobody can find a replacement. Legislators who voted to make voters vote are now sitting on the fence en masse (weasels? lemmings? what’s a mammal that has no guts? that’s the metaphor to use here). 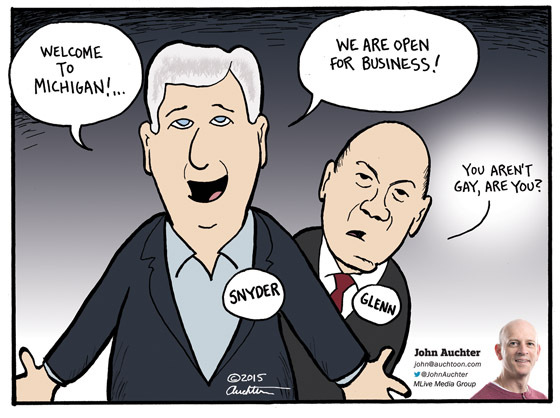 And although Governor Snyder manages to say something positive on occasion, it is certainly not the relentless positive we’ve come to expect from him. It’s a mess. I just thought that needed to be clarified.